At long last my baby elephant is finished and I can post it here and show her off. I say her because through out the process I was calling her Elly. 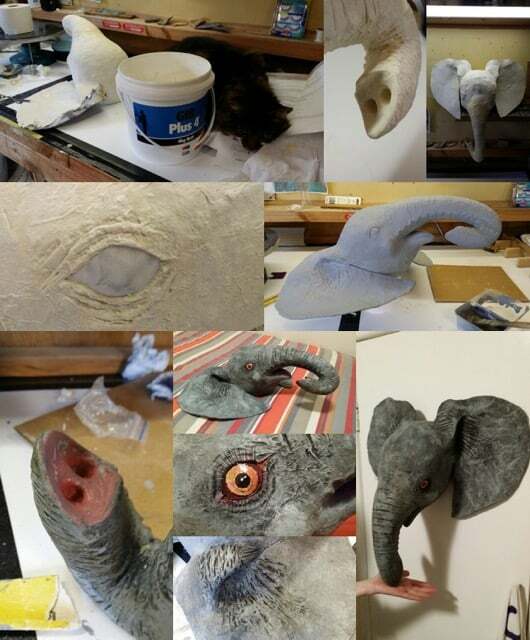 I started with your amazing pattern then added one layer of paper strips, then a layer of paper clay and while that was still dampish I applied two layers of a very thin toilet paper which when applied wet with paste took on a crinkled effect which mimicked the skin of an elephant perfectly. The clay was applied again in areas where I wanted deeper detail like the ears. I also gave her a tongue and nostrills to further the realistic look and I think these turned out really well. Lke you I gave her false eyelashes which I got my daughter to purchase for me as there was no way as a 57 year old male I was going to buy them. The eyes were finished off with two coats of clear nail varnish again courtesy of my daughter. I am extremely happy with my finished Elly and cant thank you enough both for the pattern and for getting me interested in Paper Mache. P.S. My Jacket Rabbit is also very close to completion. I just need to take it to work tomorrow to drill some very fine holes in it’s cheeks for its whiskers. Hopefully I will post pictures of it tomorow night. Hi Basil. I felt a bit embarrassed myself when I bought my fake eyelashes. I think I’m a bit old for that sort of foolery, but the clerk didn’t giggle. I’ll bet if you buy your next set, you may even get an interesting conversation started with the sales staff. Way back when I made my full-sized baby elephant, I went into the local lumber store and asked for a scrap of plywood. “What do you need it for?” the guy asked. “An elephant,” I replied. I enjoyed it, even if he did think I was nuts. 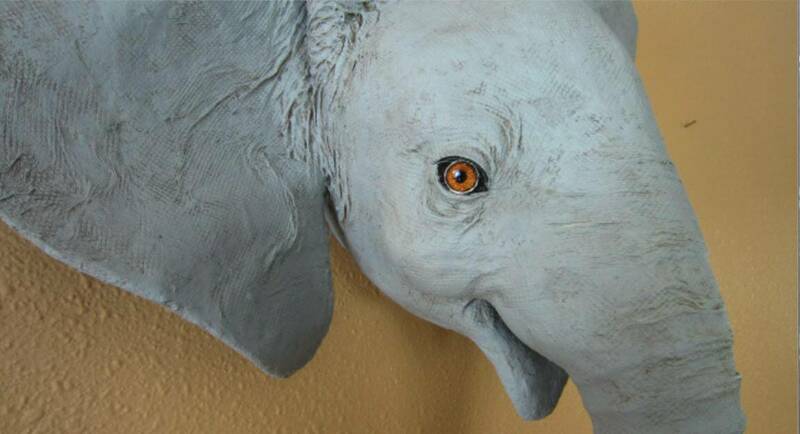 The nostrils on your elephant were a great addition, and the eyes are outstanding. The toilet paper over the clay really does look like elephant skin. Does it crinkle up like that by itself, or did you help it along? If you happen to have time, would you be interested in writing up a guest post to show us exactly how you did the skin, and any other special ideas you used to make your elephant so nice? If you would, just let me know. Jonni Hi, I would be very happy to do a guest post on your website, just let me know what I need to do. The toilet paper I used for his skin is the one we use here at work and it is very thin, not at all appropriate for it’s purpose, but perfect for elephant skin. I applied it in small pieces by brushing it on with the paste onto freshly applied clay. It crinkled all on it’s own. Thanks again for your comments. Let me know if you run into any problems with the form. Wow ! That is real cool my is not finished yet but I love it . I forgot to make the holes on the truck lol but I have time I see if I can fix it . Thank you . IIlanka Hi, sorry i have not replied before now. I usually get emails letting me know of any new comments but for some reason alot havent been coming through lately. Hope you managed to do the nostrils in the end. it is another detail that is probably me being a little over the top but I do like realism. Thanx for your comments. Wowwww, this is gorgeous! what paint did you use? Cole Hi, sorry i have not replied before now. i usually get emails letting me know of any new comments but for some reason alot havent been coming through lately. All paint was acrylic. Mainly white and black mixed to two shades of grey then the colours mentioned in the post for the eyes. Any chance you would be up for making another to sell? 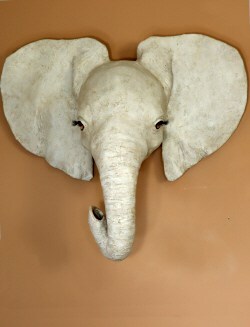 I am looking for someone to make an elephant head for our first baby nursery. If anyone would be up for this please contact me. I would love to depending on where you live. I am in New Zealand so feel freight costs etc. around the world might not make it worthwhile. I would hate it to get damaged in transit as well. Where are you based. I am unfortunately in California. Is the finished product fragile? 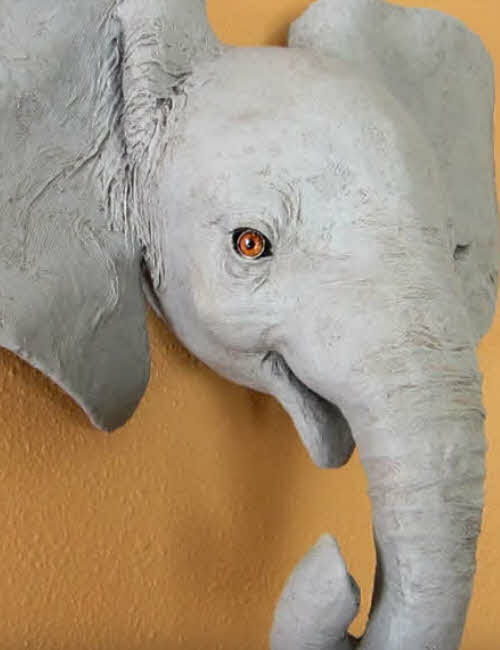 My husband and I would love to incorporate elephants into the baby’s nursery as we were recently inspired by the elephants during our holiday in both Namibia and South Africa. Please let me know the best email to get in touch with you and we can see if this would work. Cheers! Selina Hi, Yes it is somewhat fragile but I am sure I could pack it well enough to make it to California, but, I worry about what might happen in transit. I am happy to sell it to you if you are still keen. I have also completed a young bull elephant which is also posted on this site, you may be interested in. Please email me at [email protected]. Subject 3 d elephant. At what point did you hook the nose on to the head. Can you make the whole head then add on trunk? Yes, you can do it that way. I started at the end of the trunk and worked up, but you could put the pieces together any way you want to. Hi, after downloading the net and reaching C-5, C-6 seems to have disappeared and the doesn’t seem to be a way to retrieving the files? Is there a way you could help? I’ll send you an email with the download link so you can save it again to your desktop. Check your email inbox in a few minutes, and it should be there. I have just started a project in a Primary school in England and will be making models for corridors. (A time-line of history to help the children understand the different eras). My first art piece is a Mammoth head. I’m researching how best to go about this. It needs to be light but strong. I would like to draw on your experience on how to mount the mammoth on the wall too? Have you heard of ModRoc? It appears to be bandage covered in plaster that you wet before applying. Have you an opinion on the product? I may use fake fur too, but not sure as it will get very dusty. You have a great website by the way. I’m learning on the job! Hi Jill. I use a product we call plaster cloth, and it sounds very much like the ModRoc you’re referring to. I made my Indian Rhino that way. After the plaster cloth was dry I removed the clay form, and made it completely hollow. Then I added a very thin layer of the air dry clay to smooth it out and so I could add the strange skin textures. He’s very light, very strong, and two years later he still looks great. I don’t know a thing about fake fur, of course. I did add some yarn “hair” to my Highland cow, but the process was a bit comical, since I didn’t have a clue. It looks pretty nice, though. I think your idea of using the plaster cloth is a very good one. I found that the layers of plaster cloth don’t stick too well unless you use warm water. For a public display, you’ll probably want to use about 4 layers, to make it strong enough. Making a flat back so it will hang well could be a problem, since even plywood will warp if you put something wet over it and it dries just on one side. It would be best to leave the back without any plaster cloth or paper mache, if you’re using it, and then cut a piece of light plywood in the right shape after the form has been removed from the Mammoth. Screw it on, with washers, through the edge of the plaster cloth all the way around, and then cover he screw heads with whatever material you use to finish the head – but don’t put anything on the plywood itself. I hope this helps. And I really hope you’ll show us your Mammoth after it’s done. This sounds like such a fun project! The kids are going to love it. Thank you for your prompt reply. Lots of great advice, thank you. I shall be taking pictures of the process so I’ll upload a couple to your website for your interest. I have 8 models of different things to make in total, so I’m going to have a lot of fun. Here’s the final Mammoth, I took snapshots along the way. Hope you like it. It will be installed shortly and I’ll add greenery and rocks on the wall for interest. 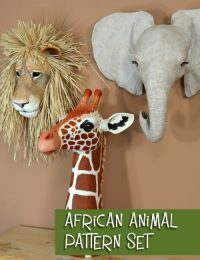 Please can you let me know how you attach your animal heads to a back board and what fastenings you use to mount on the wall. Thanks, hope you can help. Jill. Hi Jill. I use a saw tooth picture hanger on the back of my wooden plaques, and then use hot glue to attach the head to the wood. So far, it’s worked just fine. Epoxy glue might be more permanent. When I don’t want to use a plaque, I just drill a hole in the back, near the top of the head, and hang it by placing the hole over a nail. Wonderful! He has such a delightful character – I can’t help wonder what he’s thinking. 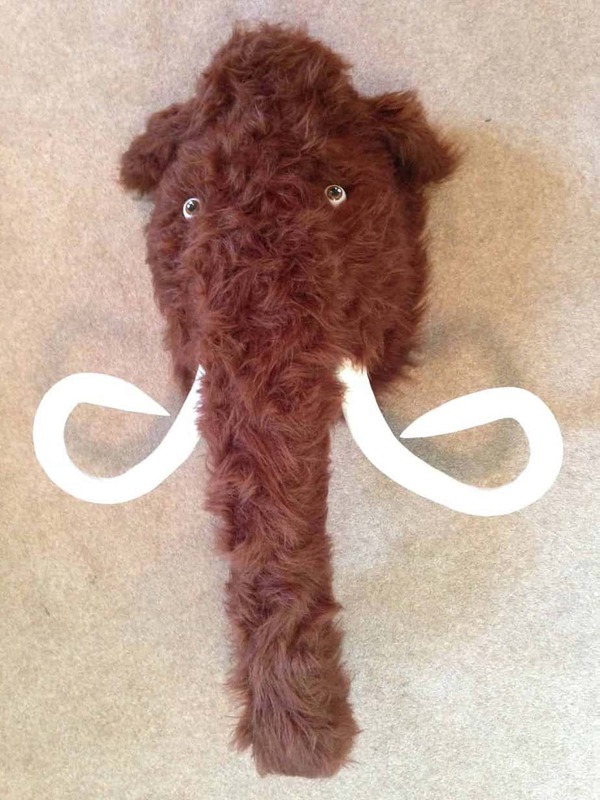 Would you be interested in writing a guest post for us, and show us you made your mammoth? You could use your progress photos in the article. If you think you’d have time to do it, just let me know. Yes I would like to write a post. Glad you like him. Thanks Jonnie. Excellent! Just send your post in an email when you have time to write it, and I’ll post it right away. Ok, rabbit and frog are ready to gesso and paint! Elephant still in the clay stage. Hopefully by the end of the week I can post some pics. I know you said you were working on a moose next, but maybe after you could do a lion or tiger? I think that a big cat would be awesome and I would totally pay for a pattern of one! You could do a male lion with a mane, subtract mane for tiger? Slim down the faces for female. One pattern could work for multiple animals. And my daughter wants me to do a pinata. I think she’s thinking about a certain birthday that’s coming soon. I am extremely excited about the black bear and over the moon about the lion or tiger!!!! Whooppee! I finished the armature for the baby elephant today, and went back to watch the video for some tips and noticed something. Your armature when it is in the paper puzzle stage is much cleaner and has a better shaped out come then mine. At various stages in making the elephant ( and the rabbit and frog) I had to use the packing tape to get the joins to stay put. So I end up with more tape bunched up where I would rather not have it. The pieces come out at the end, when covered in masking tape pretty close to yours. So for the elephant, I had a lot of issues with the mouth and have more tape in the corners then you do, how did you get that area so put together without the 5 lbs of tape? I also have more squared line shapes in her than I would like even though I smoothed down the points. How are you getting the soft round look to her? Since you just finished the elephant and I just started I figured it would be a good time to ask, because I had the same issues with the frog and rabbit but didn’t think to ask. 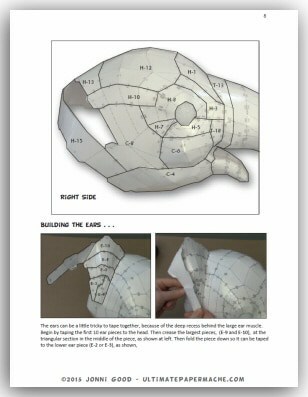 Basically, how do you get the paper puzzle armature to look so flawless? Hi Brooke. Since I had several thousand people looking over my shoulder, I took a lot more time when I put my pattens together than I would have, if it was just for myself. The one thing I did that helped the most was to turn over the pattern and retape the tabs on the back as I was putting it together. And if the plastic tape still didn’t hold, which tended to happen at the corner of the mouth and the deep depression behind the ear muscle, I’d use masking tape on the back, which seems to stick better to the plastic-covered pattern. The elephant’s mouth is definitely the hardest part, because the shapes change so drastically in that area. But, fortunately, even if it looks a bit ragged before the paper mache is added, it should look fine after it’s done. 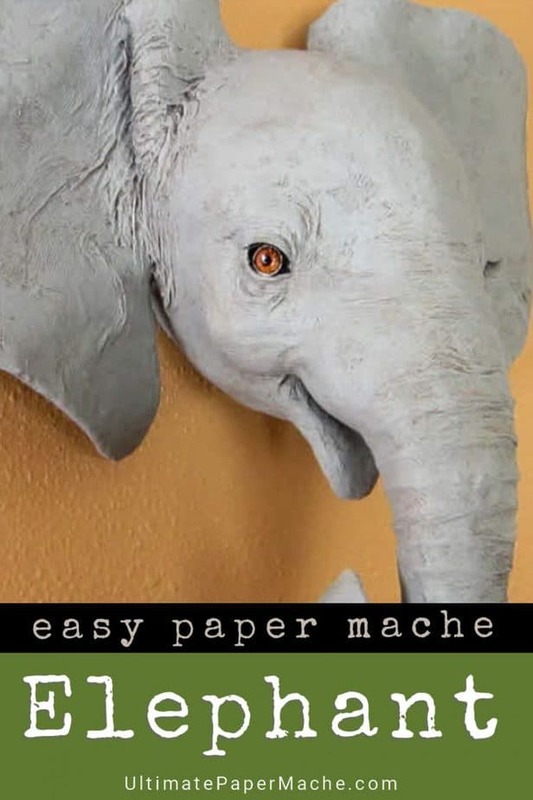 Will you be using the shop towels on the elephant, or the paper mache clay? Hello Jonni! I am feeling better and have masking taped the frog, in the process of fixing the rabbits features with foil, ready to tape the elephant together, and working on my nemisis the head of a pig guard from Star Wars. (The silly thing has an actual name but my iPhone keeps spell checking it) So I have run across a few questions. 1. The frog, you used boiled flour and water as the paste but say it’s the weakest paste to use. I have never used it before but am willing to try. Is this the paste you suggest I use on the frog? 2. For the rabbit, if I want to use shop towels (don’t like the brown paper it never turns out right for me) what paste should I use boiled or raw? By the way, remember when we tried to figure out why my rabbit came out smaller than yours by so much and thought it might have be the printing step that made it that way? Well it was. I had to spend 30 minutes getting my Adobe pdf opener to print the actual size of the pattern for the elephant. This is what shrunk the rabbit. I Wanted to let you know so that you could tell people when they print the pdf patterns to change the “fit” to actual size or they will have off patterns that frustrate the heck out of them when they try to piece it together. I printed a page from the rabbit, once using the setting I originally printed the pattern out as, and then once with the setting changed to actual. The difference in piece size is different enough to see it. Hope this bit of info can help and prevent the troubles I had piecing the smaller version together! Hi Brooke. I’m glad you’re feeling better. It sounds like you’re a good at multitasking, with so many projects going at once. I think if you’re using the shop towels, the cooked paste works best. This is how I make it: 1/4 cup all-purpose flour whisked into 3/4 to 1 cup water. Put it over medium heat, mixing constantly. As soon as I feel the mixture starting to thicken, I take it off the heat and whisk again to make it nice and smooth. The paste needs to completely soak the shop towels, and I think the raw paste would not do that, since the flour tends to separate from the water just a bit if it isn’t heated. I went over my frog with more paste several times, because the shop towels can soak up a lot of the paste. If they don’t soak up enough paste, they don’t get hard and stiff like we need them to. Excellent suggestion about the printer adjustments, by the way. Thanks for that! My printer just automatically prints to size unless I tell it not to, so I didn’t know that other printers work differently. I’ll add a note to the other pages in the morning, to let people know. PRINT TO ACTUAL SIZE. That’s the one you need. That you so much for the recipe details! I am planning on sitting down Saturday to start so I will keep you updated. Hi Brooke. I hope you’re still having fun with the paper mache heads. I finally added your message to the jackrabbit page – I got distracted because I’m trying to get my house ready to sell. I didn’t realize how much time it would take just getting things organized enough to take decent pictures. But now your message is up, and if people follow your instructions, their jackrabbit pieces should be big enough to work with. Thanks! I wish I had more of those things, too! I love your work! The elephant is stunning. I love the texture. 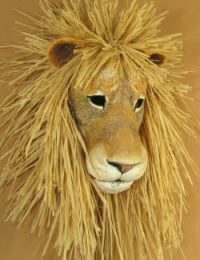 I used lots of paper mache way back in college, making masks and puppets, I miss it and am out of practice! We need to make a large(3′ across) globe structure. We’re using an inflated yoga ball, with alternating layers of bogus paper, newsprint, Kraft paper. Wonder what you think of adding a layer of old sheet strips with PM paste for strength. I’m concerned with the shape keeping it’s stability due to the size. I imagine the fabric would add strength and make it less likely to suffer from punctures or holes if mishandled. Have you ever done this? Any thoughts? Thanks in advance! Hi Robin. The fabric might add some reinforcing if used with the paste, but you might want to consider Dan Reeder’s technique of using white glue diluted with water instead of paste. I think he dips the sheet material into the glue mixture, so it’s completely soaked with glue. He uses the fabric as the final skin on all of his dragons and monsters, and many of them are really huge. He says the cloth mache adds a lot of strength to his sculptures, and it should certainly work for your globe, too. je suis passionnée par vos sculptures! mais, please, existe t’il des explications en français? No, sorry. I don’t speak French – but you can translate the page using Google Translate. I recently made a huge cracked egg using your clay recipe. Love it!!! Thank you for sharing this with us. I now want to create a tree stump. Do you have any suggestions as to how I can get the texture for the tree bark? HI Amanda. I haven’t tried making bark, although it’s something that really intrigues me. 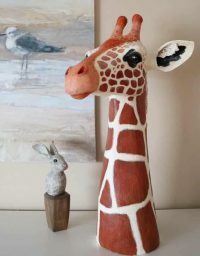 I suppose it depends on the type of tree, but some bark has really deep crevices, which you could create if you used a thick layer of paper mache clay – thicker than I usually suggest – over a thin layer of clay that’s already dry. Then use the tip of a sharp knife to score the valleys in the patten found on your sample of real bark. The air dry clay recipe might work for this, too, if you put it over the dry layer of paper mache clay or over an initial layer of plaster cloth. Whichever recipe you try, you could wait for the “skin” to dry out just a little, and then use real bark as a stamp to get the bumpiness. Remember, though, that I haven’t actually tried this – I’ve just thought about trying it. Experiment a bit – and let us know how your tree stump turns out. We would love to see that cracked egg, too! Hi Amanda, how about using aluminum foil to get the different textures and then put either paper blue shop towels over to get the shapes and then add the paper clay recipe to get the final shape of your bark. That could also be another option. I got this idea from watching several YouTube tutorials on how to make bark with cement and one artist used aluminum foil to make his bark. I h ope you find what you want. this project should be interesting. Ooh – I like that idea! Now to matters in hand; your new creation is absolutely fantastic. This little beauty is positively smiling. Is she going to be named? As for the Earthy idea on designing a Globe, be it for ancestral projects or endangered species hot spots, or any other brain-storming executions = a resounding ‘yes please’ from me. Would be delighted to purchase a 3D image from you and give it a go. Hi Izabella. 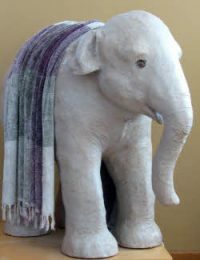 I haven’t named this elephant – I think I’ll leave that to the people who choose to download the pattern and make their own. Knowing me, I’d probably forget the name in a few hours anyway. There won’t be a pattern for the globe – I’ll just make it over a rubber ball. As soon as some of our snow melts I’ll head to the store and get the biggest one I can find. Thanks Jupira. If you’re looking for a complete elephant, I have two – a full-sized baby Indian elephant here, and a much much smaller adult African elephant in my book. And for cats, we have one of those, too. (Scroll down that page to find all the cat videos). Enjoy! Wow! Wow! Wow! What a great project with a great end result. You are very meticulous and all your efforts show in the final outcome. I also was pleased that you decided to have a small donation for the pattern. it will enable you to purchase more supplies and continue with this fabulous blog. Every little bit helps. It is good to know that your best critic was pleased. What a wonderful feeling. My grand daughter can’t even talk yet but she points and says “wazthat?” at my sculptures. Anyway Jonni- well done! What’s next? Thanks, Eileen. I think I’m going to make a planet next, over a large ball – several people have written in some questions about how to do it, and it’s given me an urge to make one myself. I have a plan for it – it will be Earth (if I can come close to getting the continents right) and then I want to stick little flags or stickers where all our family’s ancestors lived before moving to the US. And then – I want to make another pattern, for a moose. I am so excited!! Can’t wait to put this one together. Just bought it and it’s printing now, I may have to wait a few day because I a very sick but …I am so excited! On a seperate note the pattern for the rabbit did come out small due to the printer. I had to spend 30 minutes in settings fixing it to print actual size. Thanks for the tip Jonni! Hi Brooke. Thank you so much for buying the pattern. I was a bit worried that nobody would want one – you really never know when you start a project like this, after all. And I’m so sorry you aren’t feeling well. I hope it isn’t anything really serious, and that you get better soon. Will you be able to show us how the elephant (and the jackrabbit, and the frog) turn out when you have them finished? As soon as I feel a bit better, just the flu going around Wisconsin at the moment, I will post the finished projects. The frog and rabbit armatures are put together just waiting for me to feel better. I usually have a hard time with the armatures so these patterns are perfect. Don’t worry about no one wanting the patterns, because they will purchase them. Think about how many books you have sold, there is a huge following and interest in this art form and so far you and Dan Reeder are the authority to turn to for advice. Thank you for all your advice and work!!! Thanks Brooke. And I’m not sure you can call it “just” flu – that bug can really make a person miserable. I think my grandson just caught it, in fact. Be sure to take it easy, and get better soon. 1. I’m not a painter. Can you explain why you use acrylic paint with gel medium? 2. What kind of matte acrylic varnish do you recommend? Does it protect your pieces from UV rays? I mixed the gel medium in with the paint to make it a bit more transparent without having to add water. You don’t really need it, but I had some sitting there so I used it. I also used it for the paste when I added the black spot for the pupil. I have a really hard time painting two equal-sized pupils, for some reason, and that’s how I “cheat.” The gel medium doesn’t make the tissue paper rip apart, the way a water-base paste would do. I discovered this secret when I covered the frog with green tissue paper. And I don’t know if the brand makes any difference with the varnish or not. I don’t put my sculptures in sunlight, but if that would be an issue, you would definitely want UV protection. I don’t think the varnish I’m using has that. I’m pretty sure they would put it in bold type in the ad if it had UV protection. I do actually have a bottle of matte varnish up in the studio that does have that feature, but it doesn’t smell very good, so I never use it. 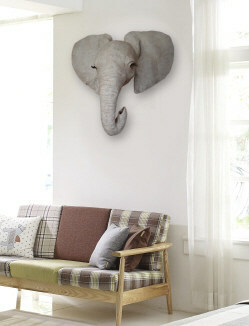 Your elephant is just wonnnnnderful!! Thank you, again, for sharing your techniques and tips. I am so impressed that you are learning to use a 3D program to create your base. Can you tell me/us more about that? What program you are using and how you are learning how to use it? At one point I had so many half-finished elephants piled up on my rocking chair in the living room, and so many bits and pieces scattered around on the floor around my computer desk, that I just had to hope nobody would decide to drop in to visit! Every time I would get a head almost completely put together, I’d find something that wasn’t working right, and I had to start over. I haven’t found any videos that would help me make that part of the process easier. But I’m having a great time learning something new. This so cute! 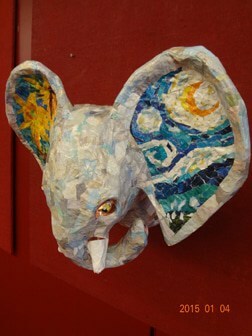 I made a Van Gogh baby elephant head for my last show. What a unique sculpture. When I had my elephant pattern almost completely taped together, with just one piece still left out of each ear, it looked like he had huge butterfly wings. I thought it would be fun to paint an elephant with monarch colors. But your Van Gogh baby is much more inventive. Very nicely done. She is just adorable. I like her smiling and the addition of fake eyelashes was nuce. It was a justified decision to charge for the pattern. You give so much of your time and talent into all your video’s, it is right that viewers pay for a pattern. 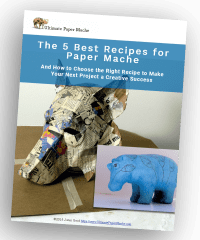 I am loving the 3-D designs and am impressed with your abilities to constantly broaden your paper mache skills and master the technology beautifully. Kudos!